This article is about the Yardbirds song. For the Yardbirds album, see For Your Love (album). For other uses, see For Your Love (disambiguation). (1965) "Heart Full of Soul"
Gouldman wrote the song at the age of 19 while working by day in a gentlemen's outfitters near Salford Docks and playing by night with the semi-professional Manchester band the Mockingbirds. He explained: "I was sleeping most of the time because I'd been gigging with the Mockingbirds the night before, and then during the day when I'd got any spare time I'd write in the shop. I used to shut up the shop at lunch time and sit in the back writing." Gouldman cited the Beatles as his influence, "We went down to Denmark Street and went round all the publishers trying to find a song ... we didn't get any songs that we liked or we weren't given any songs period and the Beatles had started and I thought 'well, I’m gonna really have a crack at song-writing.' I had dabbled a bit, but they were really my inspiration and gave me and I think a lot of other people the courage to actually do it. We all wanted to be like the Beatles. I wrote two songs and the record company we were with turned down one of the songs. The song they turned down was 'For Your Love', which eventually found its way to the Yardbirds." Gouldman's manager, Harvey Lisberg, was so impressed by the song he told Gouldman they should offer it to the Beatles. "I said, 'I think they're doing alright in the songwriting department, actually", Gouldman recalled. Undeterred, Lisberg gave a demo of the song to publisher Ronnie Beck of Feldman's, who took it to the Hammersmith Odeon, where the Beatles were performing. By coincidence the Yardbirds were also performing on a Christmas show at the venue and Beck played the song to their manager, Giorgio Gomelsky, and the band. In 1965, the Mockingbirds began a regular warm-up spot for BBC TV's Top of the Pops, transmitted from Manchester. Gouldman recalled: "There was one strange moment when the Yardbirds appeared on the show doing 'For Your Love'. Everyone clamoured around them – and there I was just part of an anonymous group. I felt strange that night, hearing them play my song." The Yardbirds recorded "For Your Love" at the IBC Studios in London on 1 February 1965. The majority of the song was recorded with singer Keith Relf and drummer Jim McCarty backed by session musician Ron Prentice on bowed bass, Denny Piercy on bongos, and organist Brian Auger on harpsichord. Guitarists Eric Clapton and Chris Dreja only perform during the song's double-time middle break section. Bassist Paul Samwell-Smith assumed the production duties and is listed as musical director on the 45. At the conclusion of the session, Auger wondered, "Who, in their right mind, is going to buy a pop single with harpsichord on it?" 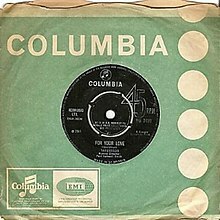 Shortly after its release by Columbia on 5 March 1965, it became a hit in the UK. When it was released a month later by Epic Records in the US, it became the group's first charting single. By then, Clapton had already left the group for various reasons, including their more commercial aspirations. The song has been covered by Fleetwood Mac, on their 1973 album Mystery to Me, and by Joe Jackson, on his 2000 live album Summer in the City, in medley with his own hit, "Fools in Love". ^ a b c d e f g h Koda, Cub; Russo, Gregg (2001). Ultimate! (Boxed set booklet). The Yardbirds. Los Angeles: Rhino Records. pp. 27, 30, 44. OCLC 781357622. R2 79825. ^ a b Clayson, Alan (2002). The Yardbirds. San Francisco: Backbeat Books. pp. 172, 196. ISBN 0-87930-724-2. ^ Frank Hoffmann (23 May 2016). Chronology of American Popular Music, 1900-2000. Routledge. p. 258. ISBN 978-1-135-86886-4. ^ The Greenwood Encyclopedia of Rock History: Folk, pop, mods, and rockers, 1960-1966. Greenwood Press. 2006. p. 118. ISBN 978-0-313-32960-9. ^ Mike Clifford; Pete Frame (25 August 1992). The Harmony illustrated encyclopedia of rock. Harmony Books. p. 194. ^ a b c George Tremlett (1976). The 10cc Story. Futura. ISBN 0-86007-378-5. ^ "Good evening and welcome to a very special I Write The Songs here on BBC Radio Wales with me, Alan Thompson". The10ccfanclub.com. Retrieved 15 January 2015. ^ "Kirsty MacColl: Connections". The Kirsty MacColl web site. Archived from the original on 13 October 2007. Retrieved 10 July 2018. ^ Dafydd Rees; Luke Crampton (1999). Q Rock Stars Encyclopedia. Dorling Kindersley. ISBN 978-0751311136. ^ "16 Brian Auger Talks About the Yardbirds' For Your Love-.mov". YouTube. Retrieved 15 January 2015. ^ Unterberger, Richie. "The Yardbirds: For Your Love – Song Review". AllMusic. Retrieved 25 October 2016. ^ Rees, Dafydd; Lazell, Barry; Osborne, Roger (1995). Forty Years of "NME" Charts (2nd ed.). Pan Macmillan. p. 152. ISBN 0-7522-0829-2. ^ "RPM - Item Display: Top Singles - Volume 3, No. 17, June 21, 1965" (PDF). RPM. Canada: Library and Archives Canada. 31 March 2005. This page was last edited on 6 November 2018, at 01:31 (UTC).